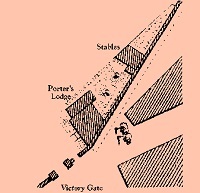 Recreated on the original 1754 site in Portsmouth Historic Dockyard. Find out about the garden, its plants, sculptures, history, and visiting. Read all about the garden and visiting. Catch up with the latest happenings in the garden. A selection of photographs taken in and around the garden. It’s a joy to see the garden wake up after Winter. 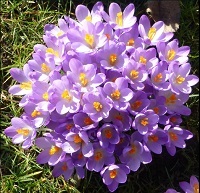 The highlights are spring bulbs, tree blossom and flowering shrubs. Find out more about the original garden and how it was recreated. 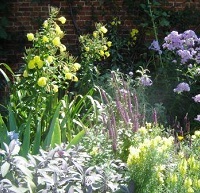 The garden features many plants common to an 18th Century garden. Many of these are detailed here. 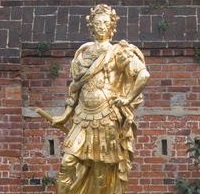 The gilt statue of William III might be the most noticeable but the garden has a number of statues, sculptures and specially comissioned pieces. April - Tulips are amongst the most popular of bulbs, valued for their brilliant flower colours and shapes. 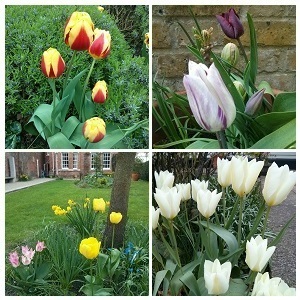 The yellow and red tulip pictured top left is Tulipa 'Keizerskroon'. You can find these, flowering now, all over the garden. You can also see full size photos in our gallery.